Before I answer those, here’s some facts about eggs. Now, there are many types, such as duck eggs, goose eggs, turkey eggs, and quail eggs, I’m going to focus on the humble hen egg. Getting good balance in your alkaline diet is vital. The balance of acid to alkali in a pH balanced diet depends on portion size. In Acid-Alkaline Dairy and Egg Products Food Chart, I list the PRAL values for many different ways of preparing eggs. In that list, we see Egg, whole, cooked, scrambled with a PRAL value of 7.59 for 100g. Therefore, PRAL values, despite there precision, are best thought of as a range. It just happens that a typical serving of two large eggs scrambled is around 100g. So, we can say that the PRAL of eggs is 7 to 8 in a typical meal. Of course, eggs are acidic! Eggs are a valuable protein source. Protein is the biggest factor in PRAL calculation. 100g scrambled eggs contain around 10g protein, and about 150 calories. Are asking about the pH of eggs? I.e. the acidity of eggs in the lab? Maybe you need this information for packaging purposes. I can’t really help you with this. I deal with the acidity pf eggs after you have digested them. In effect, this is the effect on the pH of your urine. PRAL is one of the best estimates of the effect of food on the kidneys. This is a very good indicator of general health. Of course, if you have specific health problems, you must discuss the effects of an alkaline diet with your doctor. I hope you can see that it does not matter that eggs are acidic. What matters is balance. 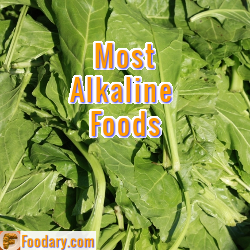 If you want the best alkaline diet, you should aim to make each meal alkaline in total. However, there’s no point in making life miserable. Adopt healthy eating plans on a daily or weekly basis. Whatever suits you. One easy way is to look at one weeks shopping. As I’ve explained, detailed PRAL analysis is only ever an estimate. Therefore, I’m working on a simpler scoring system that makes alkaline diets easy. Please sign-up to my update service to stay informed about that new project. So, if you want to balance an acid-forming egg breakfast with an alkaline-forming lunch, that’s up to you. 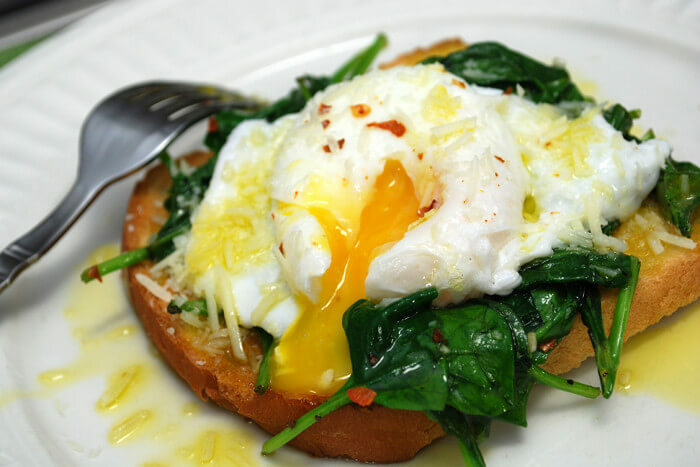 If you want to make your meal alkaline, spinach is a fantastic accompaniment to eggs. Eggs are acidic. But, served over spinach, your egg meal is alkaline! The exact recipe will affect the precise PRAL calculation. We really don’t need to know that. A good estimate for one large egg with one and a half cups of spinach is about -20. That’s an excellent start to an alkaline day. Share your questions, experiences, and opinions about Are eggs acidic or alkaline in the healthy eating forum.